This image contains two rarely photographed planetary nebula (PN) in the southern constellation of Centaurus. The larger (6′) object in the upper right (north) is Melmer-Weinberger 2-4 (MeWe 2-4) at RA 14hr 01m 20s and DEC -50d 40m 41s� (Melmer and Weinberger, Mon. Not. R ast. Soc. 243, 236-240, 1990)� The smaller (2′), brighter object in the lower left is Frew 2-8 (Fr 2-8) at 14hr 0m 46s and -51d 2m 23s.� They both appear to have similar distances of 3,400 light years (Frew, Ph.D. Thesis, 2008, Macquarie U., NSW, Austrailia, Planetary Nebula in the Solar Neighborhood. Statistics, Distance, Scale and Luminosity Function).� Fr 2-8 was found in the Southern H-alpha Sky Survey Atlas (SHASSA, Field 057) while they were measuring the H-alpha flux from nearby MeWe 2-4.� These are the only two references that I could find on these objects and I could not find any color images.� 22 hours of exposures, including 20 hours of 3 nm OIII and 5 nm H-a + [NII] were required to bring out some of the faint detail in these objects. 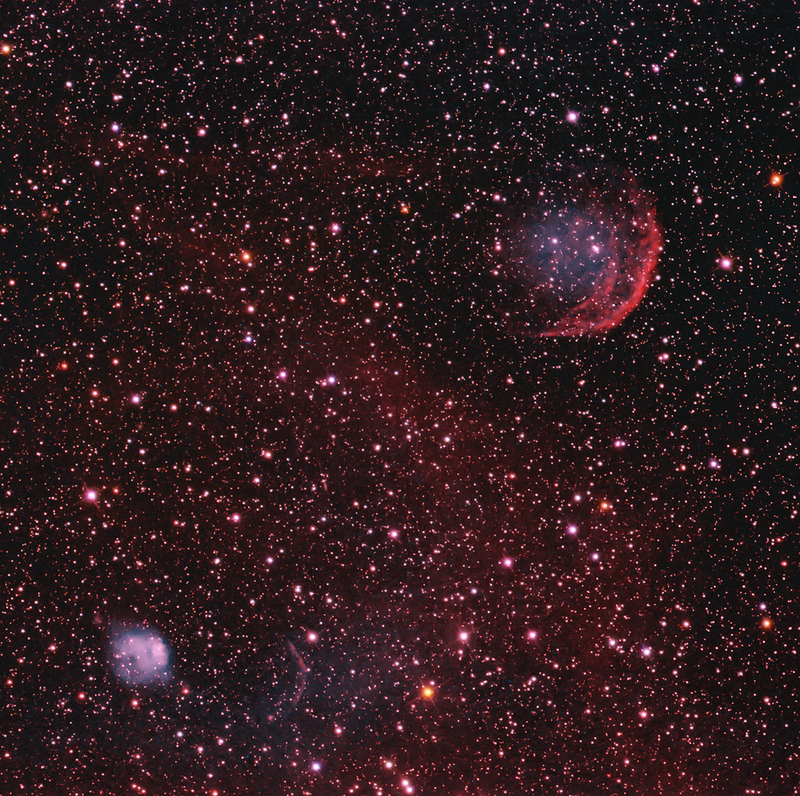 OIII was mapped to blue/green (teal) and H-a to red/magenta.� Star colors were added with 2 hours of RGB data.� In particular, MeWe 2-4 appears as half a sphere with a relatively circular OIII-enriched central region and a complex set of brightened rims toward the west (lower right).� There is little or no emission signal toward the east.� This could suggest an interaction of the PN as it moved through the interstellar medium (ISM).� The brighter Fr 2-8 is strong in both H-a and OIII.� Frew indicated that it is a high excitation PN.� There is some background H-a emission.� Whether the bright arc to the right (northwest) of Fr 2-8 is part of the PN or ISM is uncertain.� Aesthetically, it is pleasing to be able to find two rarely photographed PN that just happen to fit into the field for this image.� I wish to thank Sakib Rasool for suggesting this. for the imaged of the two Pne including Frew 2-8 PNe – I predict another arc on the opposite side of the PN at the bottom equidistant from the PNe to the West.